Para Mil 2, awaiting a little brother. 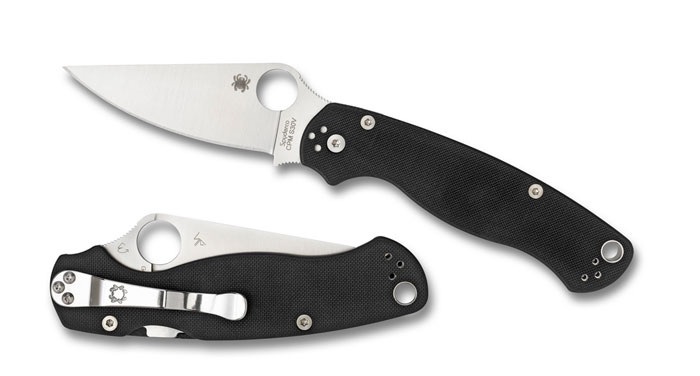 In the Spyderco booth at BLADE Show 2015, there was a knife labeled the Para Military 3, as in a “three-inch blade.” It appeared to be a scaled down PM 2! I am frankly partial to smaller EDC-carry knives. They can perform daily chores, but in the hand of a trained martial artist can have definite defensive capabilities. Think Delica. Just what you need and none of what you don’t. Bigger may be better, but when one’s EDC can dispatch some boxes or an apple, then deal with a mortal threat with the same tool, all is well. If I was going to see the elephant, a large fixed blade would be appropriate. A knife should fit your use and environment. For most of us civilians, a small folding knife will suffice. In Para Military guise, it should be very handy. This entry was posted in Knives and tagged BLADE Show, Folding Knife, Para Military, Spyderco. Bookmark the permalink. While I haven’t seen this knife as of yet, I have seen what is referred to as the PM-1.75 which appears to be a custom from William Davies of Bladeswelove.com. You can see them on his Instagram page. The blade length from what I have been told is just a tad over 2-3/4″. He offers several options for colors and texture of scales making it truly personal. He has dressed up my own PM-2 with red textured scales, along with bronze clip screws and a bronze lanyard loop. He does nice work and will do whatever you like in a timely fashion. Knife lovers everywhere should check out his Instagram page. It will definitely have you yearning for a new knife!